If you haven't noticed by now, we like to rank things here at Baseball America. We give you the top 30 prospects for each team, the top 20 in each league, the 500 best draft prospects, and the weekly shuffling of the best 25 college teams in the nation. In this issue alone, we have the annual Top 100 prospects and the top 50 high school programs in the country. With that in mind, we here at Business Beat are going to get in on the fun. February in the minor league world is when teams start to get antsy and take to social media with countdowns of the days before the season opens. While that's going on, some teams also like to drop their promotional schedules to whet the fans' appetites for what's to come and, of course, to get a nice spike in ticket sales. Bobbleheads are a favorite throughout the country, Baseball America headquarters included. With that in mind, here are the top five bobbles to be released during the upcoming season we at Biz Beat have seen so far. Baseball fans' love of the "Major League" movie franchise is no secret. The original film is to Cleveland baseball as "Bull Durham" is to baseball in North Carolina's famous Triple-A city. So, on June 25, the Rubber Ducks, Cleveland's Double-A affiliate in the Eastern League, is honoring one of the film's most beloved characters, Willie "Mays" Hayes, with a doll of his own. The twist? Instead of his head, it's Hayes' legs that do the bobbling. Better get to Canal Park early for this promotion, because they're sure to go fast. Bird had surgery to repair a torn labrum in his left shoulder, so fans in Scranton and the Bronx aren't likely to see him at all this season. That doesn't mean they can't take home a little piece of the slugging first baseman. On June 3, the RailRiders will give away a Bird bobblehead with a unique twist. Instead of swinging a bat or fielding a ball or anything baseball-related, Bird is depicted hatching from an egg. Because, you know, he's Greg Bird. There have been dolls with bobbling bellies, bobbling legs and even ones with real, styleable hair, but this is the first known bobble featuring a mammal emerging from an egg. The doll won't help Bird heal any faster, but it will help salve fans' wounds while they wait for his return in 2017. If one bobblehead is great, a set of three must be even better. 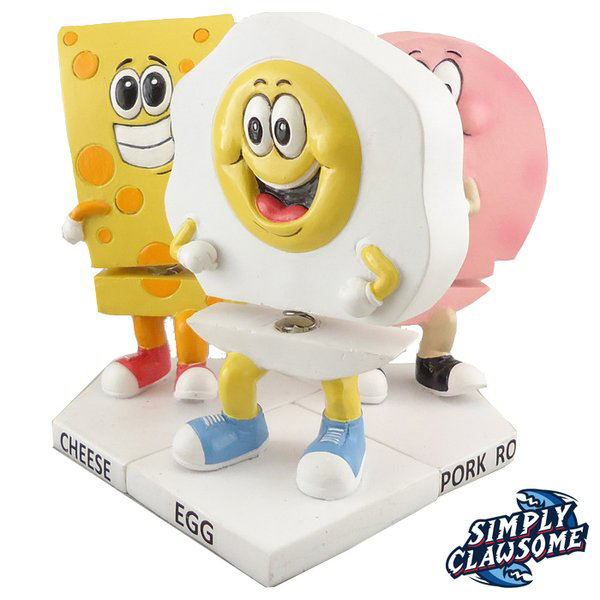 In an homage to three of New Jerseyans' favorite foods, as well as Lakewood's three ever-dueling mascots, the Claws will give away a collectable of set of three dolls. Pork Roll is up first on June 30, followed by Egg on July 25 and Cheese on Aug. 17. Whether you're a foodie or just a baseball fan, you'd be wise to collect all three of these trinkets. Because, really, what's pork roll and egg without cheese on top? FIRST LOOK: Larry Holmes bobblehead giveaway! Full promo schedule now available at ironpigsbaseball.com. Philadelphia is known for, among other things, boxing. It was the setting for the universally beloved “Rocky” movie series, and a run up the the 72 steps in front of the Philadelphia Museum of Modern Art is must-do for any tourist in the City of Brotherly Love. With that in mind, it’s only right that the Phillies’ Triple-A affiliate got in on the fun. On May 3, the Pigs will honor all-time great boxer Larry Holmes with a bobblehead of his own. Holmes, who grew up in Easton, Pa., which is just 20 minutes away from the IronPigs’ home base of Allentown, won his first 48 fights and is one of just five fighters to defeat Muhammad Ali. The bobblehead will be given to the first 3,000 adults through the gate, so get to the park early to have a fighting chance. The P-Nats this winter held their first fan’s choice bobblehead contest. Fans were invited to submit their ideas, and the best eight were chosen for a vote. Of the finalists, which included a bobble llama (say that five times fast), Gio Gonzalez and his dog, Stitch, emerged victorious. Because the vote was so close, however, the team decided to produce the runner-up, too. That would be Nats second baseman Danny Espinosa sporting the glorious Fu-Manchu mustache he wore last season. Sure, Espinosa had a season to forget, but his glorious mustache deserved to be immortalized for future generations to marvel and admire for years to come. Thanks to the P-Nats, and Twitter user @NatsBobbles, who submitted the idea, that’s exactly what will happen. There will surely be more amazing bobbleheads revealed, but for now these five stand (bobble)head and shoulders above the rest. League champion Lexington (Royals) boasts one of the deepest crops of prospects in the league. Hurricane Florence, which strengthened to a Category 4 hurricane Monday, will create some tricky scheduling scenarios. Muzziotti, 19, has returned after missing two months because of a broken finger.